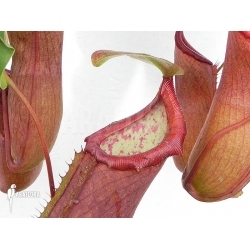 This tropical pitcher plant is a hybrid from the Netherlands that produces striking, reddish coloured pitchers. It is easy to cultivate indoors and does not have any special requirements. As this species is not found in the wild, by buying one of these plants you will be helping to perpetuate and spread an attractive hybrid. The plant is 20 centimetres tall and approximately 15 centimetres wide. If the conditions are right it will gradually attain a height of 2 metres. The large pitchers display a striking contrast between their green inside and red outside. 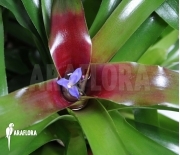 This plant can be grown in a hanging basket or in a free-standing pot. It is capable of flowering all year round, producing clusters of yellowish brown flowers. Nepenthes Linda needs a considerable amount of sunlight but must not be placed in direct sunlight to avoid dehydration. As with other Nepthenes species it requires a relatively high level of humidity to promote healthy growth. It needs a good deal of distilled water that can drain easily from the pot. It needs to be sprayed regularly to ensure the pitchers remain healthy and last for a long time. The best temperature for this type of Nepthenes is between 15 and 25 degrees Celsius. The best growing medium is neutral or slightly acidic peat. If the plant becomes too big, simply prune it.